In 2008, Jenny Macke founded Presence Studio, creating a community space for embodied freedom, exploration and expression. She teaches the Sunday Morning - Open Floor Community Dance and the Thursday Night - Open Floor Deep Practice plus a wide variety of workshops and ongoing groups both here and throughout the US. 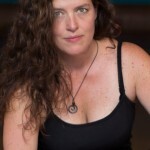 Jenny is a certified Open Floor teacher, and also serves on OF's Curriculum Circle. Prior trainings include nine years as a 5Rhythms® teacher, many years as a Nia instructor, and a Masters in Leadership Education. Her work is also inspired by her teachers and mentors Jillian Froebe & Authentic Movement, Wilderness and Soul Work of the Animas Institute Bill Plotkin, Heather Munroe Pierce’s dance circles, and Susan Harper and Continuum. She is also a Licensed Massage Therapist and Bodyworker with a deep belief that her work with her hands is meant to help people remember their wholeness that is inherently a part of all us. Jenny is a wild and wily dancer, inspired by the landscapes of her home in the Pacific Northwest. She is a mother, artist, dreamer, lover, and she honors all peoples' worthy pathways to coming home through soul and body.